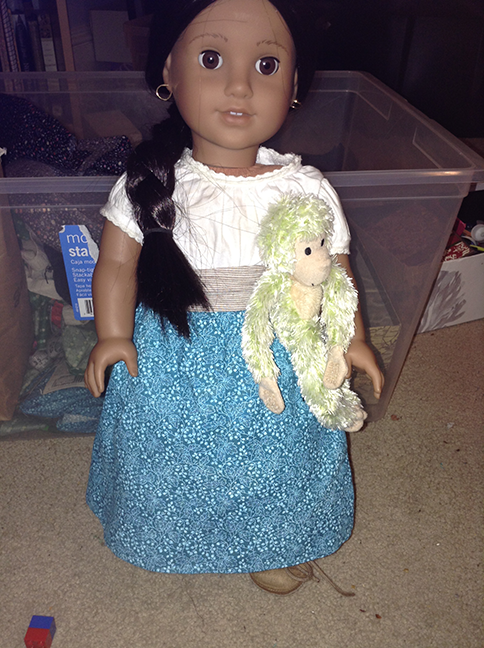 Josefina's skirt is made of teal fabric with a floral pattern that I thought might work for her time period and personal style. 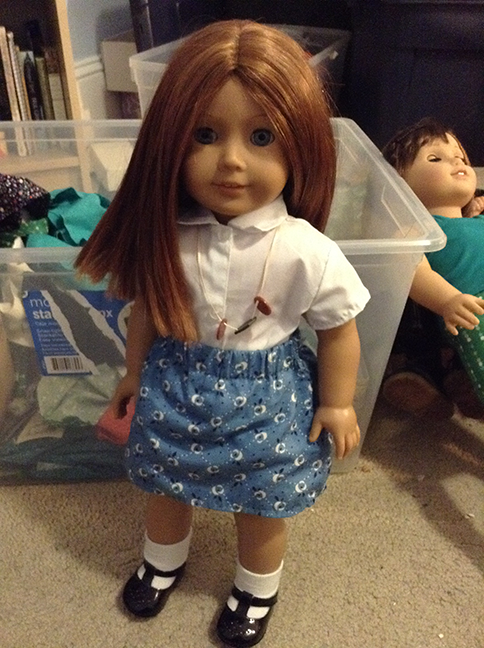 The waistband is elastic, but you can't see it underneath her belt (which is actually a headband from an Our Generation outfit, since I can't seem to find her original!). Caroline's tunic shirt was originally an Our Generation playsuit, but I thought it would be more versatile as a shirt that could be worn over jeans or leggings, so I snipped the leg openings of the playsuit, folded the extra bits of fabric inwards and sewed them together to make it a shirt instead. Caroline is modelling it over Saige's denim leggings. 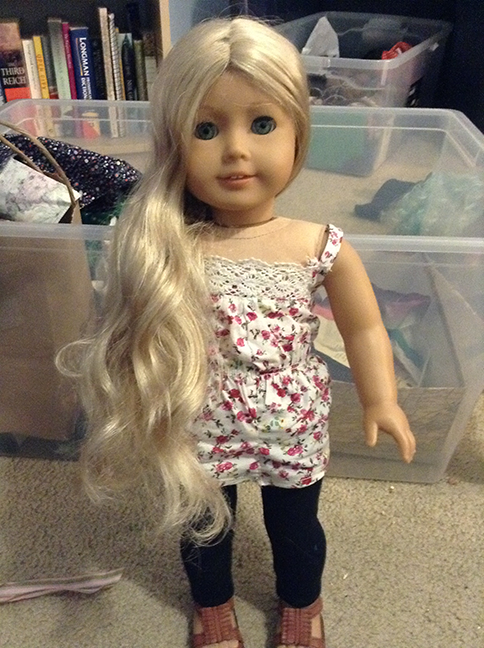 Grace is wearing a sleeveless t-shirt and skirt; I experimented with the shirt by making it have slightly bow-shaped velcro straps. Not sure how it worked, but it was a try, wasn't it? I made Alice a knitted black t-shirt and skirt, which she's wearing with the top of Felicity's Riding Habit. 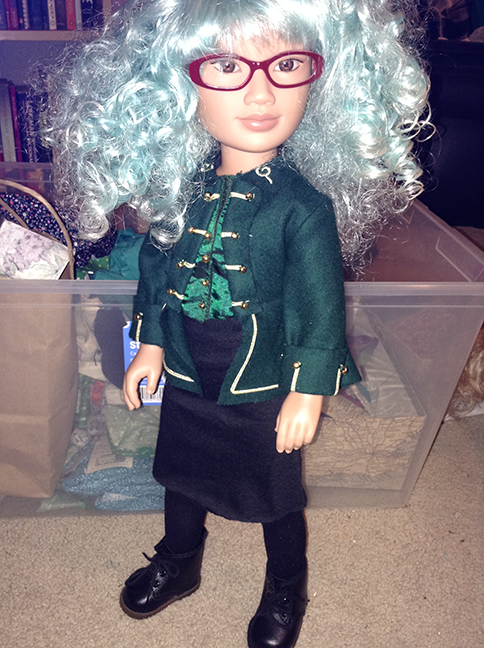 Unfortunately it's a bit more difficult to see than the others' because of the habit, but I think it's a good combination (though not very seasonally appropriate right now - it's a good thing she's a doll, or I think she'd overheat).